Chuck Norris Facts are an Internet phenomenon of satirical 'facts' about martial artist and actor Chuck Norris. The 'facts' tend to involve absurdly exaggerated claims of Norris' toughness, attitude, virility, and masculinity stated in an absurdly serious tone. 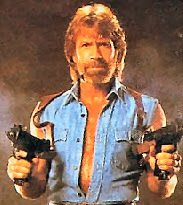 When Chuck Norris answers the phone, he just says 'Go.' This is not permission for you to begin speaking, it is your cue to start running for your life.